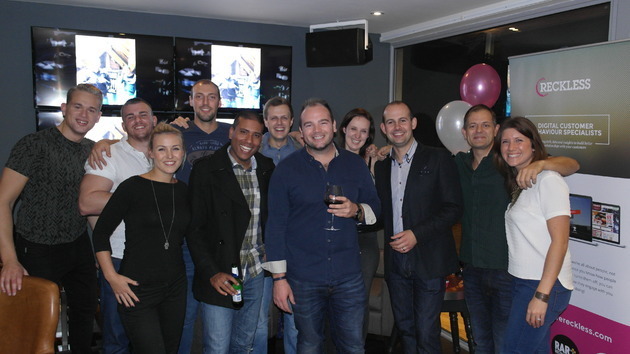 Chester based digital agency, Reckless turned the grand old age of 7 this month and celebrated in style with a party at the beautiful 1539 Restaurant on the historic Chester Racecourse. The team celebrated with a night of great food, drinks and wonderful conversation to look back over the past 7 years, with clients old and new, as well as friends and industry peers of Reckless too. Callum went on to say that Reckless are now becoming an agency whose voice is being heard and is making their mark on the digital sector, with agency peers down in London voting them in the Top 5 Agencies in the UK by The Drum Digital Census 2014. They are also getting the opportunity to pitch to and now work with some incredible brands such as Ellis Brigham Mountain Sports, Mere Bathrooms, University of Manchester, The Restaurant Group and newly appointed Carden Park Hotel. A great night was had by all, with special thanks to the team at Restaurant 1539 and it marks the start of many more milestones to come from the exciting digital agency.